The battle of Kurukshtra began with Krishna’s Shankhnaad or the bellowing of the conch. Krishna, himself a great warrior, played the part of Arjun’s Saarthi or charioteer, hence the horse whip in his hand. When a conch is blown, the primordial sound of OM emanates. Before the worlds were created, there was only a word – OM. It was chanted by the lord before he created the world.It represents the world, the eternal truth, Bhramha, Vishnu and Mahesh and the three Vedas. As the story goes, the demon Shankhaasura defeated the devas, stole the Vedas and went to the bottom of the ocean. 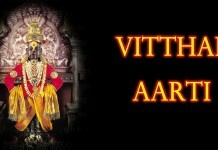 The devas appealed to Lord Vishnu for help. He incarnated as Matsya Avataara – the “fish incarnation” and killed Shankhasura.The Lord blew the conch-shaped bone of his ear and head. The Om sound emanated, from which emerged the Vedas. 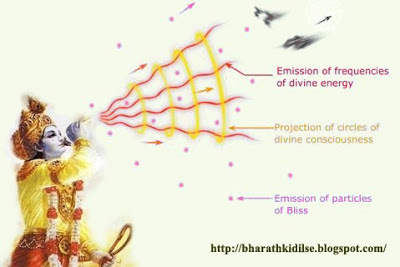 All knowledge of the Vedas is an elaboration of Om. The conch therefore is known as shankh after Shankasura. 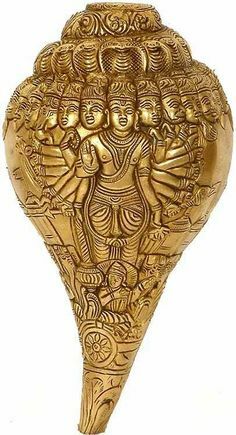 The conch blown by the Lord Vishnu is called Paanchajanya. He carries it at all times in one of his four hands.It represents dharma or righteousness that is one of the four goals (purushaarthas) of life. The sound of the conch is thus also the victory call of good over evil. The warriors of ancient India blew conch shells to announce battle, as is described in the beginning of the war of Kurukshetra, in the Mahabharat. Shankhs are blown during artis and important festivals in temples to serve as a reminder to those villagers or citizens who had missed the worship. The sound of the conch helps people to make their minds concentrate on God while praying and drive away other stray thoughts. The conch is placed in temples and even in homes as a symbol of the sound of Om, the Vedas, dharm, victory and auspiciousness. It is also at times used to give tirth water (holy water) to devotees in a temple. – According to Vedic science, it destroys the harmful micro bacteria from the atmosphere or at least makes them unconscious. – It is traditionally believed that shankh’s sound destroys the negative energy from the atmosphere. 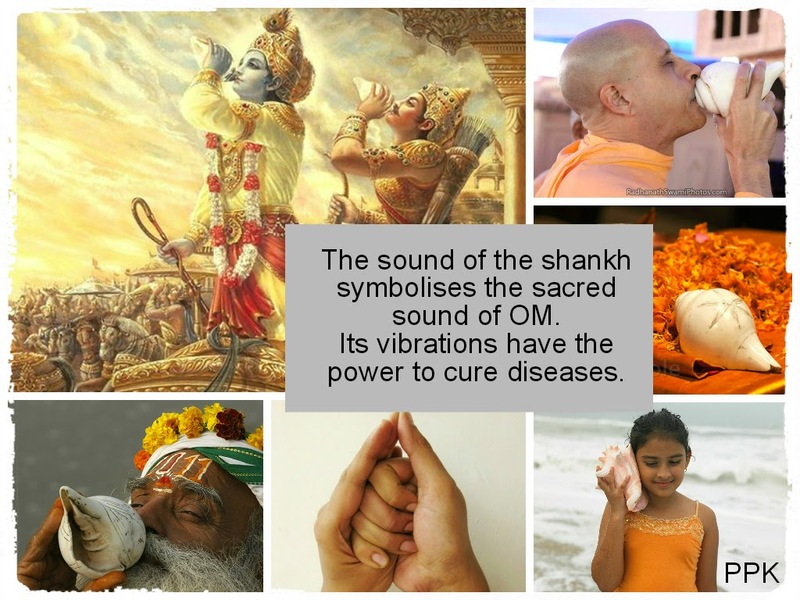 – Playing Shankh regularly is beneficial in respiratory diseases like asthma and lever problems. – Playing shankh is equal to doing pranayam that saves us from the most deadly diseases like heart attack, high blood pressure, respiratory diseases,lever related problems etc. – Offering water to sun by the Dakshinavarti Shankha can protect us from the eye disorders. – Playing the shankh regularly removes deafness and impediments. – A shankh contains plenty of calcium, brimstone and phosphorous in it, and when we put water in a shankh for a while, the water becomes fragrant and sterile. That’s why this water is used in religious rituals, prayers and also sprinkled over the people. Shankh water that is sprinkled over the people protect them from skin diseases.It is believed that if you Ganga jal in Shankh for the whole night and next day in the morning give it to heart patients and diabetics, it would be beneficial for them. Nobel prize winner Indian scientist, Shri Jagadish Chandra Bose did a lot of experiments on Shankh and its sound. He finally reached the conclusion that the shankh’s sound is special, through his experiments he proved many scientific and medical importance of the shankh.